Before now, you probably didn’t give much thought to your wallet. In fact, for most men, their wallets are typically large, unwieldy monstrosities that look like an unsightly tumor when tucked in their pockets. When they rummage through it to find credit or business card, the tightly wound bulge explodes and their cash, cards, ‘important documents’ and self-esteem are often left at the mercy of gravity. If that sounds like you, then you are overdue for a discourse on men’s wallets, and we are more than glad to oblige your unknowingness. What is the Purpose of a Wallet? Most people interpret the idea of a wallet to mean a place where they can store all their junk and unnecessary pieces of paper. Think of your wallet as a really tiny carry-on; it was designed with the purpose of stowing away bare essentials – especially those which are in frequent use. Your wallet should hold cash, Identification cards, drivers license/permit, credit cards, business cards or contact information, (and if you’re really sentimental) small photos of those dearest to you. While this is not a finite list, we can definitively say that a wallet is no place for receipts, miscellaneous cards (club membership, medical, discount) or condoms. Please… no condoms. Again, your wallet can be considered a pocket-size hand-luggage. Overweight baggage often costs a small fee, and embarrassment is very hard currency. Having established the overall purpose of a wallet, it is important to note that the process for picking out a wallet is never cut-and-dry. This is because, a wallet is supposed to suit your lifestyle; otherwise, the purpose of having a wallet is all together defeated. 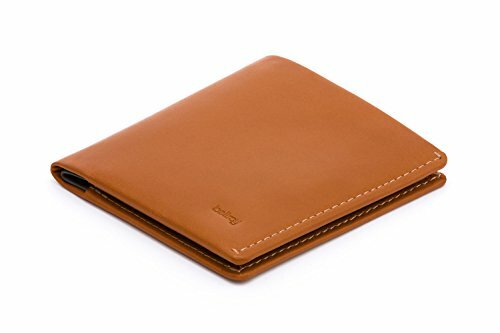 So while a men’s wallet with money clip might suit some people, others might be looking to find the best minimalist wallet for men, with the convenience of a few pockets and compartments. For travelers, a minimalist wallet might not work with all that travelers cash, and for business men a sleek wallet will probably work just fine. What are the Types of Wallets Available? The wallet market is a jungle. You think picking out an outfit is hard? Try wading through a barrage of wallet options which are all appropriately priced and look fantastic. It will certainly take a great deal of discipline not to simply buy one of everything you like. If you ever go wallet shopping, you’re likely to be overwhelmed by the plethora of options available in this category. This is because; bifold and trifold wallets are a classic. These designs feature foldable compartments that can be accessed by flipping the flaps open. With more flaps, are typically more compartments, so, naturally, trifold wallets often have more room for cards and related items. However, with this design comes the increased likelihood of a bulge, so take note. These are newer wallet designs that incorporate phone cases into their structure in order to provide a minimalist solution to its users. This way, you don’t need to have multiple items spread across your pockets, while they are less conventional than the standard bifold or trifolds, they do get the job done – you certainly won’t complain. Take a look at Dreem iPhone Wallet Review to learn more about. Wondering where to keep the surfeit of change you receive on a daily basis? Well, this wallet design that integrates a coin pouch and card slot will certainly come in handy. While they may be a tad bulkier than regular designs, it suffices to say, these wallets will prove to be worth the trouble when you don’t have to rummage through your pockets to find change. As far as minimalist designs go, money clip wallets certainly take the cake. Some have pockets, others don’t, the basic idea however, is that you simply have a ‘clip’ with which to hold your cards and money. Unfortunately, there isn’t much else that this design can take – however, you wallet shouldn’t be carrying much anyway. These are a slight advancement over money clip wallets; however these can comfortably take a few other belongings besides money or cards. The basic advantage of this design is that it slides seamlessly into your breast pocket without making any bulky impressions. Travel wallets are the traveler’s solution to passports, traveler’s checks and identification cards. With so many small-sized, important documents being in such frequent use, it is important that travelers have sufficient room, and a travel wallet fits the bill in this instance. Naturally, you’ll be left with a little bulge when using wallets with this design, but given its perks, you’ll agree that it is a small price to pay for convenience. Most wallet designs do not take items like checks or check books into consideration – and that is why the checkbook wallet is popular amongst businessmen. Of course, we are in an era of cashless transactions, but the design of this wallet is so versatile that it can conveniently double as a passport holder among other things. And if you would rather not fold your cash, or you are used to having different currencies at once, this wallet is most certainly the one for you. You’re probably wondering why this is No.1 on our list. Well, even though this list is assembled in no particular order, we cannot pretend that we aren’t a little obsessed with this Trifold piece. 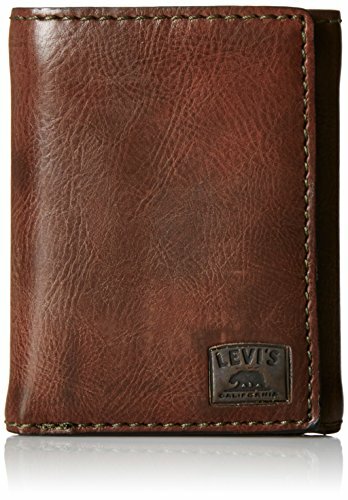 By now, most people are well acquainted with the magic that Levi’s churns out every fashion season, but a Trifold wallet that can pass for being bifold (given its compact design), can alternate through a variety of functions, packing up to 6 card compartments and 3 interior slips will certainly knock your socks off if you are a business man with an eye for style and functionality. Don’t even get us started on its 100% leather finish and triple fold enclosure that puts some ‘minimalist’ designs to shame. And with a reinforced attachment chain that connects this wallet to your belt hook, and a plastic frame/lens that allows for easy ID storage, you will most certainly be whipping out this bad boy with all the pride and ease in the world. While you might find a few complaints regarding leather deterioration, it has to do with management rather than quality. Provided you are prepared to give this material all the tender lovin’ it requires (which involves ensuring that it is stored in cool dry areas and cleaned every so often) you won’t have any problems for the foreseeable future. Ultimately, its sturdy, classic design will guarantee that your belongings are secured for a very long time. Exterior is finished with high quality leather. Spacious trifold design with sufficient room for a plethora of items. Has a unique plastic frame/card holder. A great, sturdy design with embossed edges. Leather requires some maintenance in order to avoid deterioration. We wouldn’t advise anyone to put this in his back pocket. It is likely to get bulky with too many items. If you’re looking to draw the attention of everyone – pick something made by Guess . A well-known brand in the male accessories market, Guess clearly has a penchant for elegance and sophistication that remains unrivaled till date, and their Julian Double Billfold wallet only gives credence to this fact. Compared to the Levi’s Trifold piece, most people would naturally assume that this design would have far less capacity. Surprisingly, it boasts a similar 6-card compartment as well as a 4-slip pocket, which is one more than the average trifold piece, and yet it still manages to slip right into a breast pocket without unnecessary bulge. With its high quality leather finish, you won’t have to worry about peeling or decay either. The wallet is equipped to handle a variety of unfavorable weather conditions, as well as dirt and grime without as much as a scratch. And with its single-stitched embossed logo, and a rich, black color that highlights its quality embroidery, this wallet will no doubt, have you feeling (and looking) like a million bucks. Other than the mild inconvenience of crumpling longer currencies (like pounds) there are almost no other cons to this pick. And, you have to admit, unless you’re a frequent traveler, even that isn’t such a deal breaker. Made from high-quality, deterioration-resistant leather. Spacious, with a 6-card compartment and 4-slip pocket. Embossed logo that blends beautifully. Can alternate through a variety of functions and environments. The Bellroy note sleeve wallet takes top spot as one of the best slim wallets for men in 2018. Have you seen the profile of this bad-boy? It is a billfold with the capacity of a trifold, living in the body of a pocket square! Yes, yes, you might find that it is a little above your budget, at almost $100, but when it’s gorgeous top-grain leather crests against the fabric of your inner pocket, even you will agree that it is worth every single penny…and then some. With a slim profile that features 9 card compartments with a few more slip pockets for miscellaneous materials, and an elegant pull-tab element, the Bellroy note sleeve won us over, without much effort. But hearing that its leather is environmentally friendly and biodegradable was a complete game changer – talk about giving yourself and the environment a treat! Breast pocket, side pocket, back pocket, slide it in wherever you want and it simply glides in without as much as a bulge. And with its added RFID protection feature, you can go anywhere without fear of your credit card information being skimmed and duplicated. What else is left to say? It is gorgeous, has a large capacity, environmentally friendly and can actually protect you from credit card fraud… it is pretty much all we’ve ever wanted in a wallet. You never know when you’ll need RFID protection – better safe than sorry. It is so slim, that we feel the urge to emphasize it! A little above budget for anyone looking for something below $50. If you live in a humid area, the temperature might not be too friendly with the leather. Generally, it requires a fair amount of care and maintenance. We cannot possibly talk about men’s-wear and accessories without a reference to the demi-gods of the industry – Tommy Hilfiger. The simple fact that this wallet features an embossed logo is sufficient reason to ask you to throw this into your shopping cart right away – but that wouldn’t be a fun read would it? This bi-fold wallet boasts a 4.5 inch capacity that accommodates six card compartments as well as a removable pass receptacle complete with an ID frame. Its cow-hide leather exterior will put a perfect touch to any gorgeous, matching belt or leather shoes, and provided it is kept away from humid conditions, should remain in top-shape regardless of circumstance. 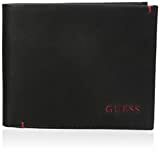 To top things off, this wallet is equipped with an RFID feature that should keep your credit card information safe, and a leather lining finish to its bill compartment that should keep your documents from slipping out too easily. Right off the bat, we are won over by the fact that this wallet’s design incorporates a coin-pouch for all your coin-storage needs – without being too bulky. It easily takes the top spot for one of the best minimalist wallets for men, and can also be considered a winner amongst the best travel wallets in 2018; so, if you are a frequent traveler who enjoys a minimalist lifestyle, this wallet might just be the one for you. The Vaultskin Notting Hill wallet opens with a premium leather material that appears to be of Italian origin – and we all know that Italian leather is the boss of leather. It combines style and functionality with a retractable strap, multiple compartments and a small sized pouch for smaller items including coins, keys and memory cards – and despite its capacity, it can glide into a front pocket with ease, even when stuffed full of items. Its highlight is certainly the RFID secure pocket on its exterior that will easily accommodate both ID and credit cards alike – and with an internal compartment that can house up to 6 cards – you are guaranteed sufficient space for all your essentials. Naturally, its 3.1 x 4.1 x 4.4 inch size, means that it can only accommodate a limited amount of coins at once without an unsightly protuberance, but considering that its compact design adds to the convenience and versatility it provides, we sure can’t complain. Made from great premium quality, Italian leather. Glides seamlessly into your front pocket with ease. RFID protection only covers one compartment, so it might not be smart to buy this for its RFID. PREMIUM, DESIGNER STYLE: Designed in Britain this tiny wallet combines style, functionality and convenience. With top grain, genuine Italian leather and high-quality metal finishes the NOTTING HILL minimalist wallet is slim and lightweight, it feels luxurious, looks premium, and is incredibly durable. The front outside pocket features the brand’s signature retractable pull-strap, giving you quick access to the cards you use most often. RFID BLOCKING & VERY SECURE: This wallet lets you know you’re safe when you’re on the go. High-end RFID (radio-frequency identification) blocking technology protects your personal information found in your credit cards, passport, etc. from electronic pickpocketing or RFID theft (specifically 13.56 MHz RFID / NFC standard). FUNCTIONAL & SLIM: this minimalist wallet has been designed to fit front pocket and despite its tiny size allows to keep your most important cards, ID, several coins, keys and other small items such as a memory card, secure. Ideal for travel. 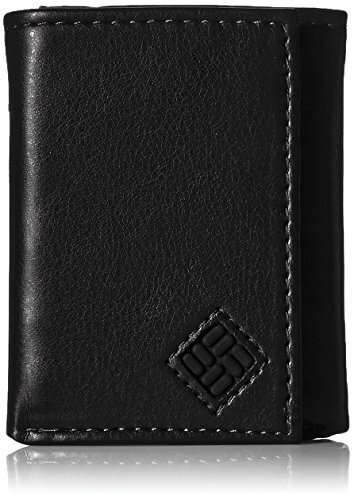 Measures: 4.20″ H x 3.10″ W x 0.60″ D.
EASY ACCESS – 4 easy accessible external pockets allow access to 6 most frequently cards. In addition, inside compartment allows up to 6 cards. The secure, high-quality metal zip, coin pocket stud and strong key hook will protect all you need on the go. WE RECOMMEND that that you keep your ID/driving license in the external RFID secure pocket with pull-strap for convenience. PLEASE NOTE – due to its small size the wallet can only accommodate small number of coins as well as up to 10 bills. THE PERFECT GIFT: Beautifully packaged in a luxurious gift box this premium look, feel and quality wallet is a GREAT BIRTHDAY GIFT idea for men of all ages. 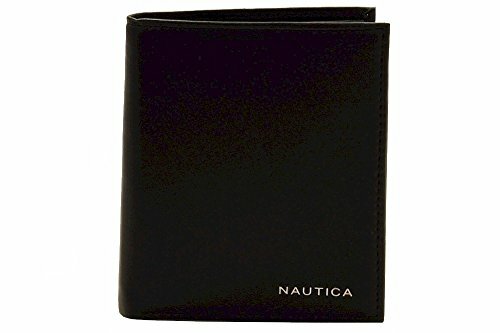 If you have multiple credit cards or you have run out of room to stash your ID’s, then you probably need a credit card wallet like the bifold Men’s Credit Card Wallet by Nautica. 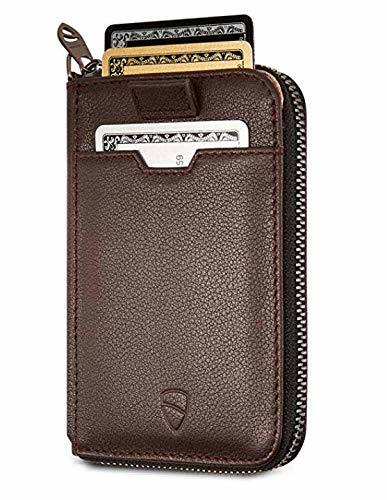 This unusually oversized leather wallet holds between 10-12 cards, with a 10-card slot complete with a protective 1D window and just enough length to accommodate regularly sized currencies. And in spite of its large capacity and dimensions, it’s sturdy build fits easily into an average sized trouser pocket. The bill compartment of this wallet conveniently splits into two further compartments which allow room for larger paper including receipts and checks. And with its seamless, top-of-the-line stitching finish, complete with a gorgeous Nautica emblem mounted on its exterior, its usual frame gives way to its true elegance when in use. Not to mention, it can alternate between a sporty and casual look without much effort. If you want something of great quality, impressive capacity and a little pizzazz to accompany, we suggest the Timberland men’s trifold wallet . Timberland as a brand is already well established as one of the top-leading makers of quality leather accessories – so, we will save you the sermon about the reliability of this wallets material. Its genuine Italian leather gives it a unique, premium texture that makes the wallet soft to the touch, but it is this wallet’s sophisticated trifold pocket that really won us over. 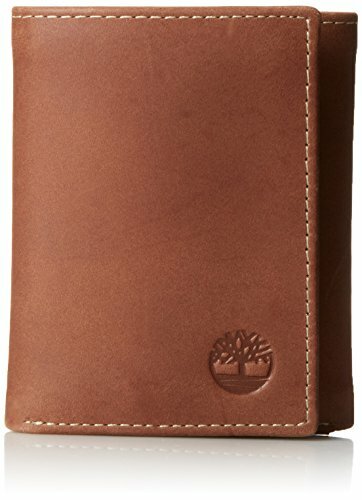 With 6 card compartments and a 2-slip slot accompanying 2 bill pockets, perfect for varying currency sizes or documents, the Timberland men’s trifold wallet proves to be in a completely different category of its own – and given its impressive size, could easily top the list as one of 2018’s best travel wallets. And, come on, who can ignore that elegant, small-sized embossed logo that simply screams class? Add that to its compact size, and the fact that it costs under $20, and you have the wallet of your dreams right here! Quite large, depending on which pocket(s) you will be tucking them away in. By all standards, this wallet is quite curious. 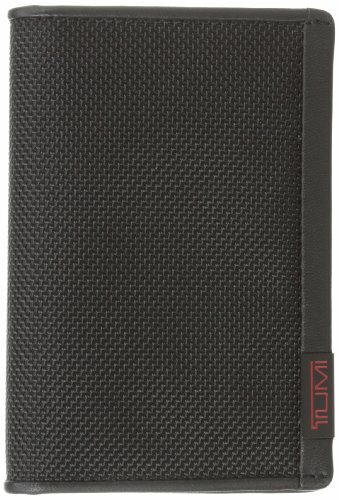 For one, it is made from ballistic nylon, which is quite unusual for a wallet, and then it has a unique mesh finish that even makes it more unique – but in a good way. There is no doubt that this beauty will make you stand out from the fleet of men with leather wallets. This could easily compete with some of the best minimalist wallets out there, but unless you have another men’s wallet with money clip, this might be a tad tricky to use. That’s right; this wallet has no provision for bills or currencies. However, with room for a 5 cards, and an additional plastic ID card frame, it might just be what you need to get by in today’s cashless economy. The wallet also has an exterior pocket behind the window, so that, if you don’t mind folding up small amounts of cash and stashing it behind a back flap, this might work for you. One guarantee you have is that you won’t find too many other wallets like this one. So, if you’re looking to stand-out, well, welcome to the world of the unconventional. Sleek design with a sporty look. It is particularly formal, so its use may be limited. Costs quite a bit considering its capacity. Looks a little frumpy when you attempt to use the mesh pocket. You didn’t think we would leave the ‘ol Polo Ralph Lauren out, did you? After leaving an indelible mark in the men’s accessories industry, we wouldn’t dare. Let’s start with the signature Polo Ralph Lauren logo that says – ‘I am a man of high taste and exquisite sophistication’. With a wallet by Polo Ralph, you won’t need any introductions, that embossed polo player will be doing all the introductions for you. 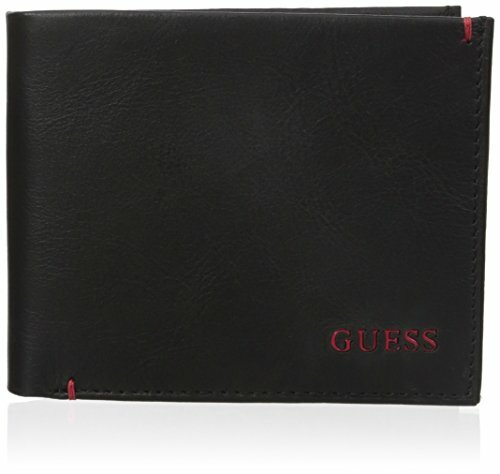 But that is just one aspect of this stylish, 100% leather wallet. The interior features room for 6 cards which can be versatile if you decide to detach its removable plastic ID holder. It also boasts two bill compartments, which has sufficient room for longer sized bills, an additional 2 card pockets which is safely tucked away from full vision, and its 3.5 inch width means that it can slip from one pocket to the other with much ease. All this without the unnecessary bulge that often accompanies some bifolds. To top things off, it’s soft luxurious leather will guarantee you a lifetime of securely stowing away your valuables in style. Provided it is handled with care and cleaned frequently. Leather requires a significant amount of care and maintenance otherwise it might head downhill after the first year of use. Our final pick in this selection goes to one of the best slim wallets for men in 2018, not to mention, one of the cheapest. For a trifold wallet, this guy is certainly sleek, and when you flip the bad-boy open, its compartments do not disappoint, with 6 ID card slots, 2 slip pockets and an additional ID card window, for all your storage concerns. Again, it is quite sleek for a trifold wallet, it closes to form a 41/8 inch height, which is impressive for its capacity. Its inner compartment is the perfect length and width for bills and papers of different lengths, and all its cards slots aren’t too snug that you have to worry about breathability or breakage. With exceptional leather material and RFID safe compartments, both your reputation and credit cards are guaranteed to be kept safe. But while we can praise this design for its exceptionally sleek features. You probably won’t get away with stuffing it full either – it is a trifold after all, and can boast the capacity one of the best travel wallets in 2018. Ultimately, you shouldn’t have too much trouble with this pick. With a convenient price tag, RFID features and a great capacity, you could actually do much worse. Perfect length and width for varying currencies. If you are used to having a currency divider, you’ll likely miss it. Credit card compartments are a little smaller than usual. Not much is left to say given the vast range of options above. Looking for a definitive answer on which wallet is best for you? Well, we don’t have one answer to that question. If what your lifestyle demands is something with some flexibility and room minus the bulk then the Levi’s Men’s Trifold Wallet might be your best bet. But when it comes to sleek, slim, minimalist designs, we have to say that it doesn’t get any better than the Bellroy Note Sleeve Wallet . And even though proponents of the Tumi Men’s Wallet would beg to differ, you have to agree that any wallet that doesn’t have any room for currency defeats its underlying purpose. You think buying the Bellroy Note Sleeve Wallet might require breaking the bank? 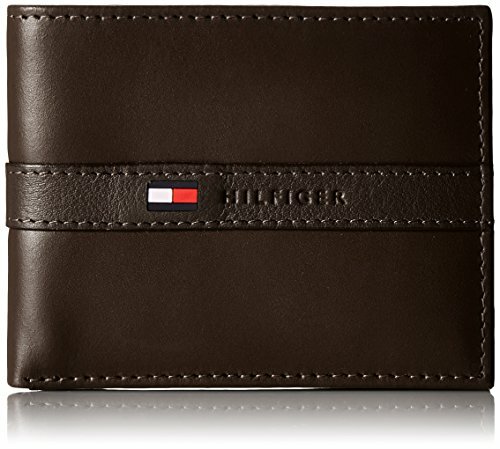 Then maybe the Tommy Hilfiger Men’s Ranger Passcase Wallet will be the best alternative for you. However, if you need you travel, anything besides the Columbia Men’s Trifold Wallet or the Levi’s Men’s Trifold Wallet might prove to be a sore mistake – just remember stick to the trifolds and you’ll be fine. Finally, your wallet says a lot more about you than you realize, so maybe it will be worth it to take a splurge every now and again towards ensuring that you always put your best foot forward – and you’ll be surprised how the seemingly unimportant things can be the difference between a life of mediocrity and one of excellence. …Ready to change your life?